We've only got four plates left, ya'll. I've been looking for fantastic vintage plates in a blue/green or yellow color way for months because we've lost two of our oven proof plates to the oven. Lesson learned. So you can understand how important it was for me to hit up every thrift store/flea market in town this week just in case there happened to be something fantastic out there ringing in at about $ .50 each. I didn't find what I was looking for but I did come across a few things from which I couldn't walk away. One of them was a fancy aqua typewriter in it's ugly old case. I can spot those cases from across the store and always, always open them to see what's inside. Eight times out of ten it's something special and this one was only $5.00. The quilted floral blanket and wood grain/doily trays were also among my inexpensive favorites from this weekend. 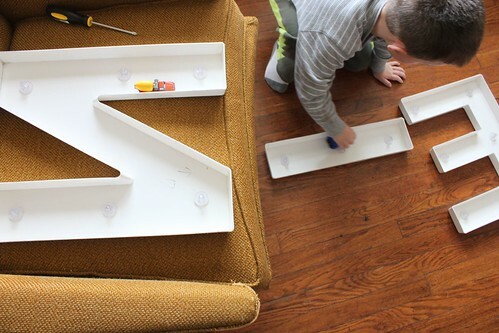 These white plastic letters from Urban are now the highlight of our living room. Sebastian insisted on using them first. I don't know what I'm going to do if we ever move to a town without great thrift stores/flea markets. Springfield has spoiled me. Love those letters from urban! The look like such awesome statement pieces!! that aqua typewriter is amazing. such a lucky find! oh my goodness you are so lucky!! Im coming to america soon and am planning a big thrifting (op-shopping) adventure! yay! That's it, I'm going thrifting today!! What a great find that type writer is. I love it the color is divine it just makes it pop. I had a urge to go thrifing now I have the urge even more so. wow, that typewriter is gorgeous. i found one this weekend too! will get photos of it up asap. As for me, I love the little trays, they will prove quite useful no doubt. I may have to treat myself to some thrifting as well. In our small town we don't often have much of a selection, but....you never know what treasures are lurking beneath the dust. I'm so jealous! Those have to be the most fabulous vintage items EVER! 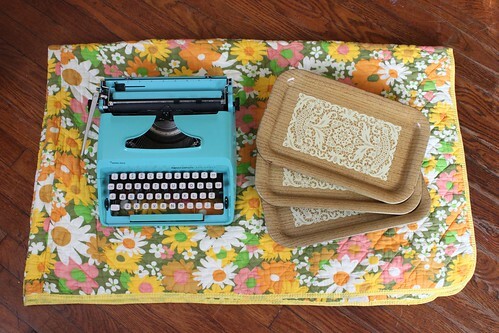 I LOVE the aqua typewriter, the wood grain doily trays and the big letters. I wouldn't have passed any of it up either! WOW! AMAZING. I love everything you got. I really need to start thrifting! man, you find the best stuff. bring some luck over this way! specifically having to do with a blue typewriter, kthx. Oh my gosh, I would've died if I found that blanket!! The typewrite is amazing, as well. Great finds! that typewriter...and with the blanket as the background...picture perfection!! great weekend finds! This typewriter is cute cute!! i love the color!! great finds!! I live somewhere with awful thrifting (Orange County). It's no fun. I always hit up the thrift store when I go home to Michigan. I know what you mean about Springfield's good thrifting. We moved to Oklahoma now and I have the hardest time finding good finds. Only in the random small towns I find on road trips can I find good stuff. Springfield has always been the best. Those doily plates are soo pretty! We went thrifting this weekend at Urban and I almost bought one of those big white letters for my daughter's room but we decided there was no place to put it, so I sadly had to pass it up. They were so cute though! I was excited about blogging about it if we did get the letters, and here I am reading your post about the letters! Too funny. I HAVE that EXACT same typewriter! But it wasn't $5 ;( Good finds girl! I haven't had a chance to do much thrifting in several months. Hoping to change that soon!! Love the finds!! I have been searching for a typewriter just like that! (sigh). Good finds! :) I'm crazy jealous of Springfield thrifting, too - lol. I'm tempted to drive cross-country & borders to shop there, myself! :) *Such* and amazing typewriter! WOW! Just like everybody else, I WANT that typewriter. Love the color...I have a scooter to match! How fun! I love your blog. Wow, you have the best luck finding cute typewriters! 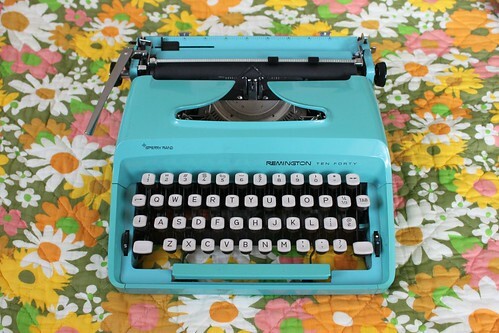 That typewriter.. oh my gosh. Seriously right now you need to stop being so cool. And finding such cool stuff. And having such a cool blog. Because all of your coolness is distracting me from my english paper..which my teacher isn't going to find too cool.